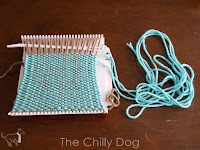 Weaving has been on my crafty bucket list for a long time. 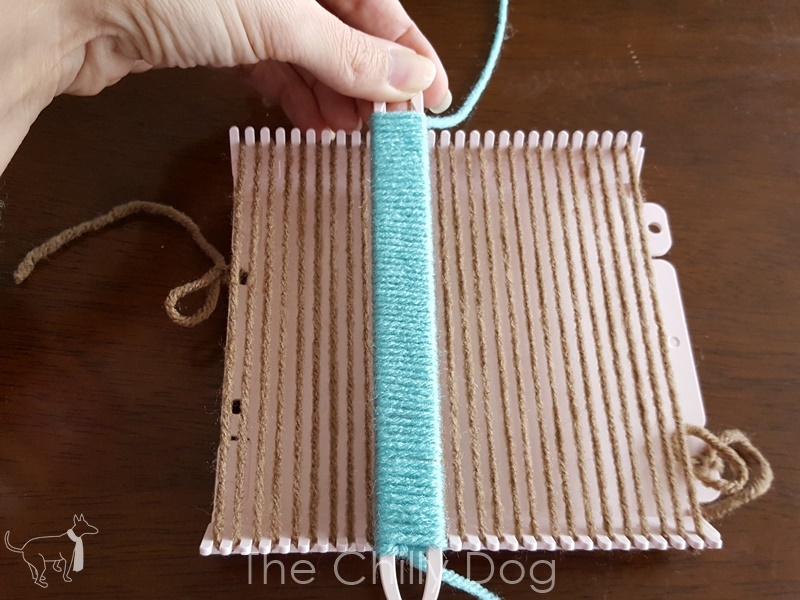 Every time I go to the yarn store I am tempted by the row of rigid heddle looms, but the price tags and time commitment to learn how to use the contraptions have always made me keep on walking. 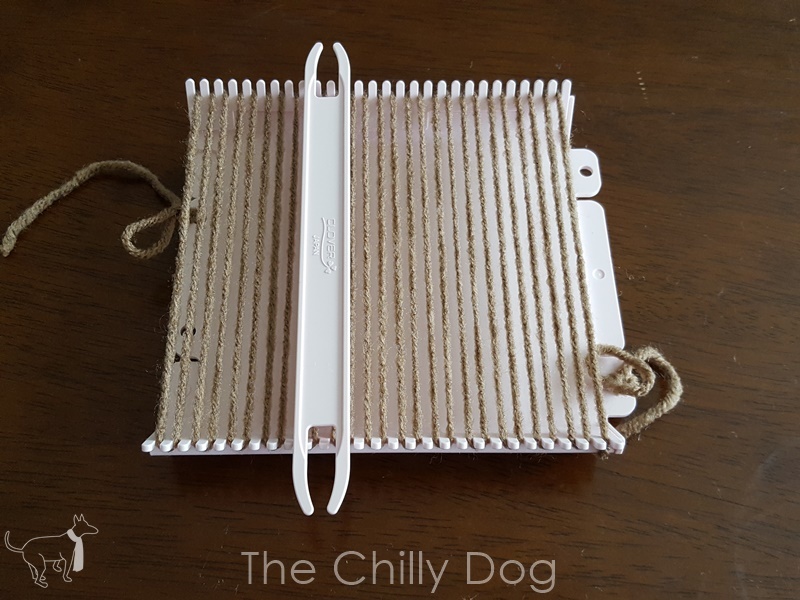 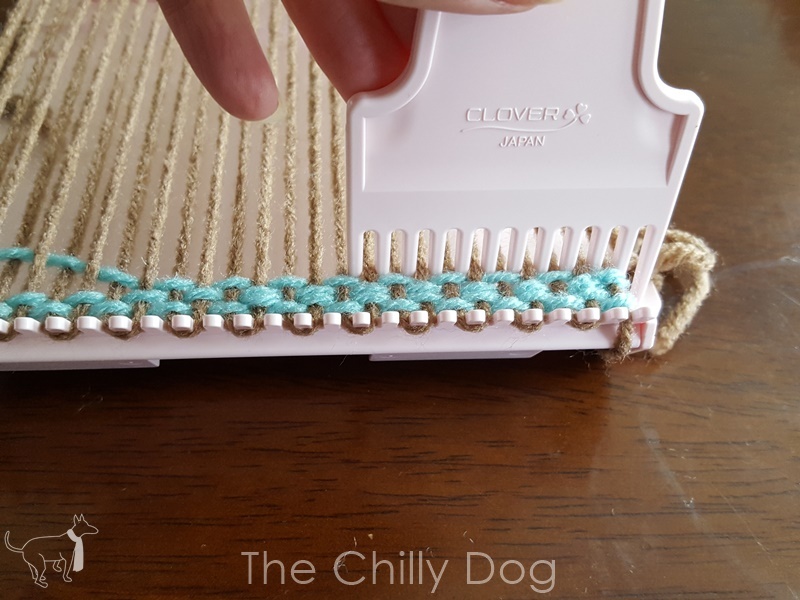 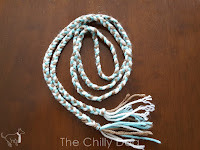 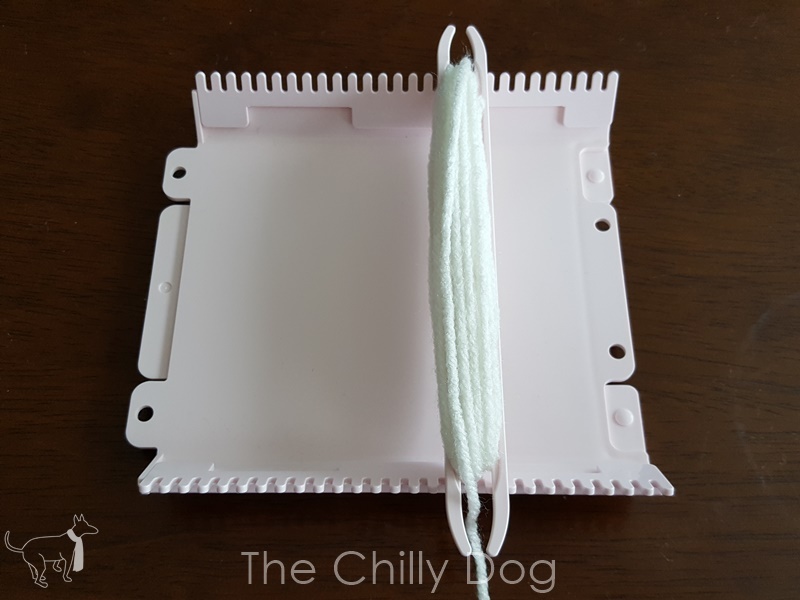 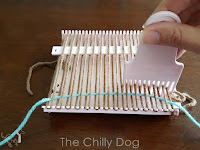 So, I was very happy to start my adventures in weaving with a simple project on the Clover Mini Weaving Loom. 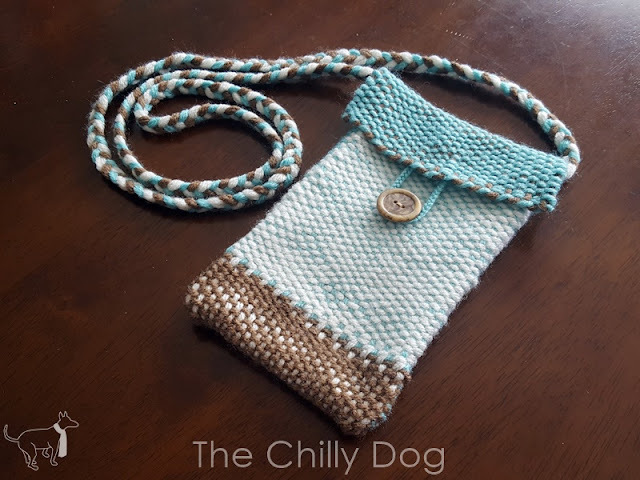 I decided to make something practical for my first project, a small, phone sized purse. 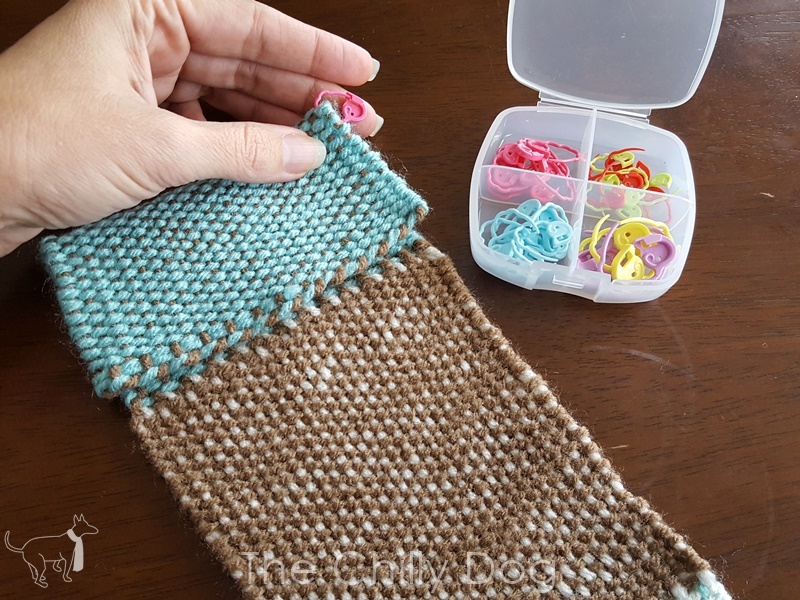 I felt pretty bold when I searched through my stash yarn for the project. 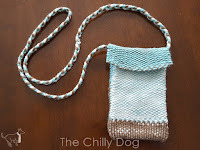 I chose three contrasting colors of a basic, worsted weight acrylic, but you could easily use a different type of fiber and more or less colors. 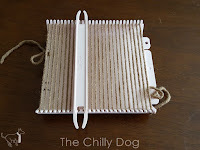 Many thanks to my friends at Clover USA for providing the tools for this post. 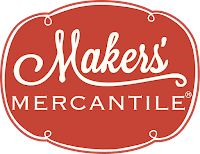 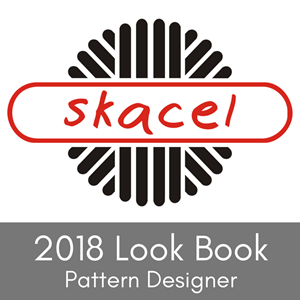 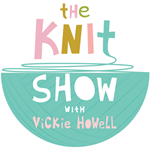 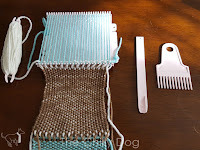 They are also sponsoring this month's giveaway so you could win the tools needed to make your own woven purse. 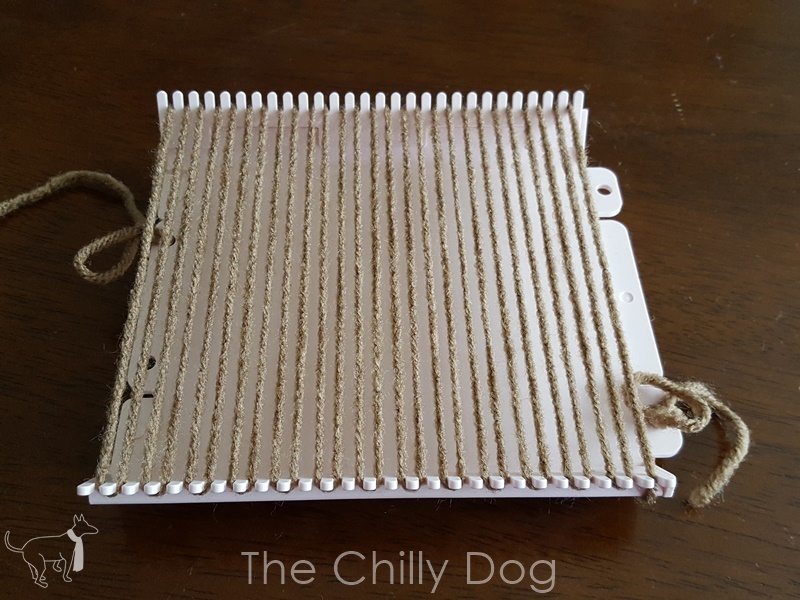 The loom comes with great directions for how to set up the warp and start weaving. 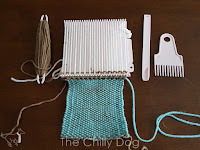 Familiarize yourself with the basic weaving instructions. 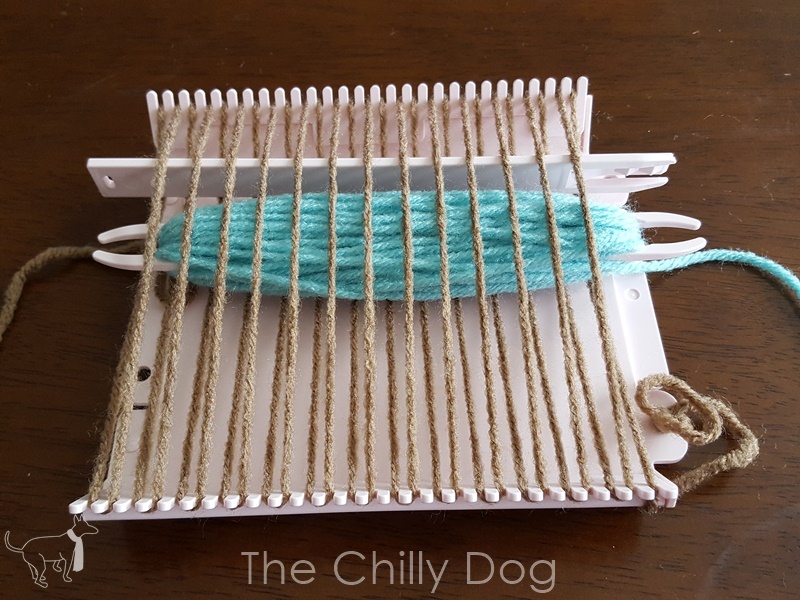 First, set up the warp on a single loom frame. 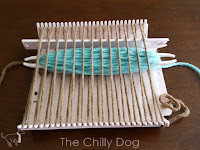 Next, you will wind the weft yarn onto the shuttle. The first time I did this I put waaay too much yarn on the shuttle making it very difficult to weave. 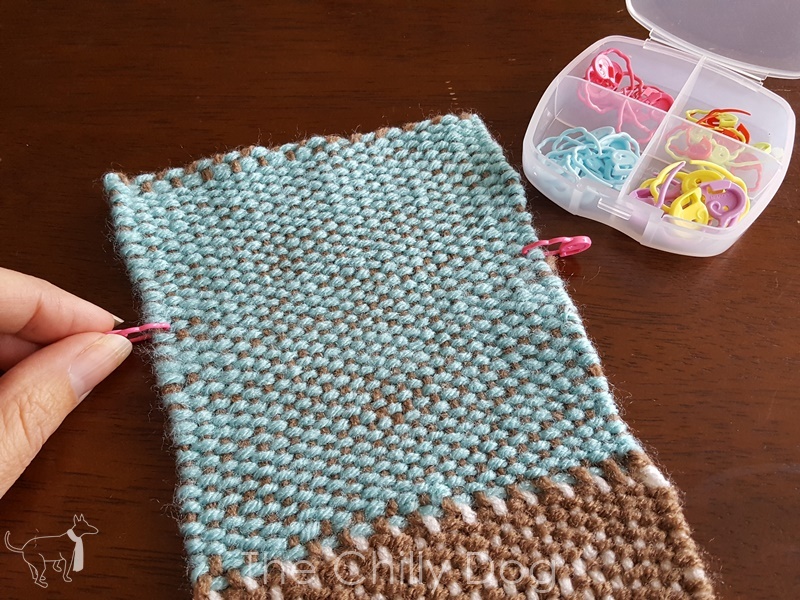 There's a simple way to get almost exactly the right amount of yarn on the shuttle. Wrap the yarn around the width of the shuttle and make sure there are no gaps between the strands. 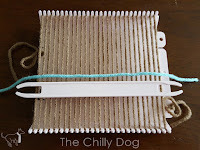 Set the shuttle on the loom and count how many times the yarn was wrapped between the two edges of the loom. 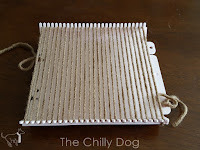 I wrapped the yarn 60 times, so the weft yarn will go across the loom about 60 times. 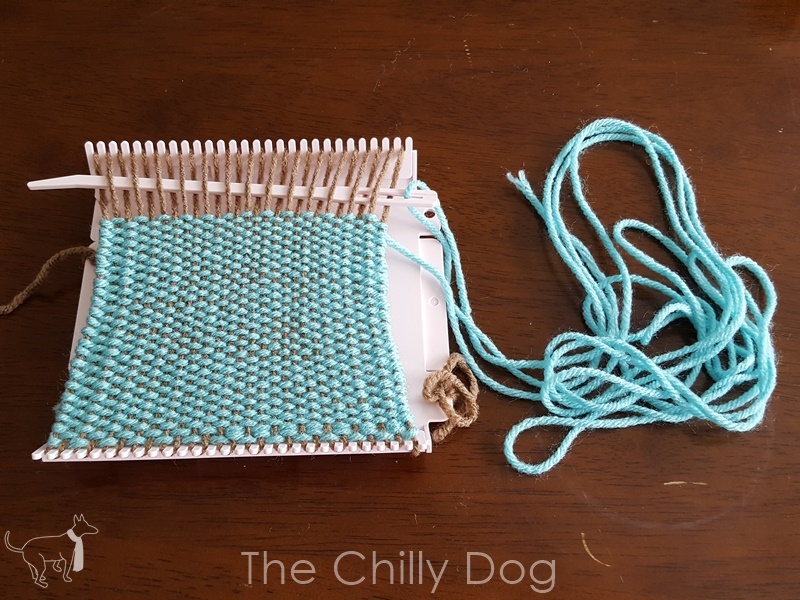 The shuttle is about the same width as the loom, so I need to wrap the weft yarn from one end of the shuttle and back to the other 30 times (that's 60/2). Repeat the process the necessary number of times. 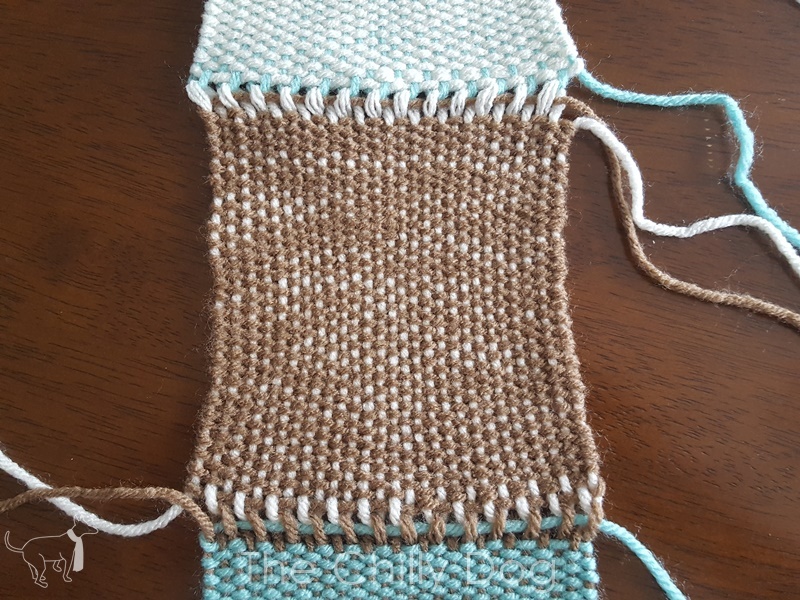 I did one extra repeat just to make sure I wouldn't run out of weft yarn. Use the shed stick to lift every other strand of warp yarn so the shuttle can pass through. 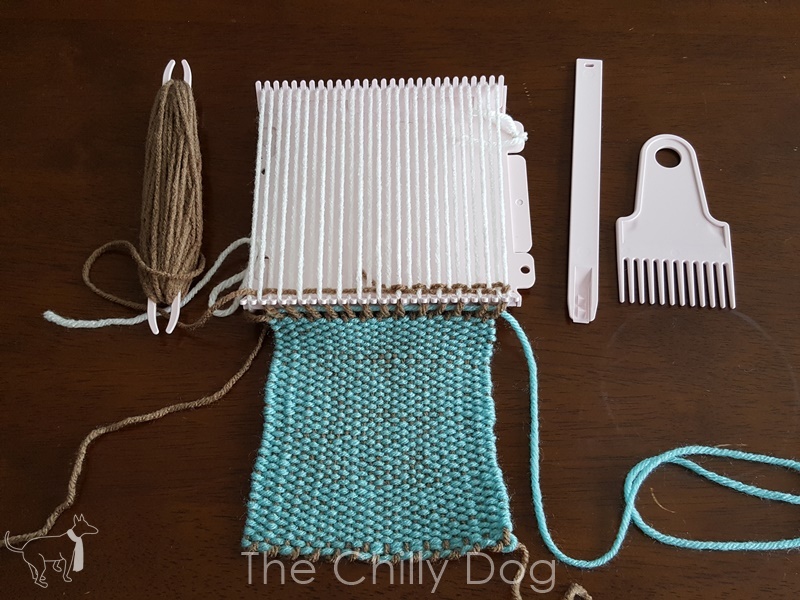 Use the weaving comb to pull the weft yarns toward you. 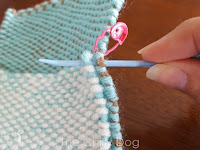 Tuck in the tail as directed and keep weaving. 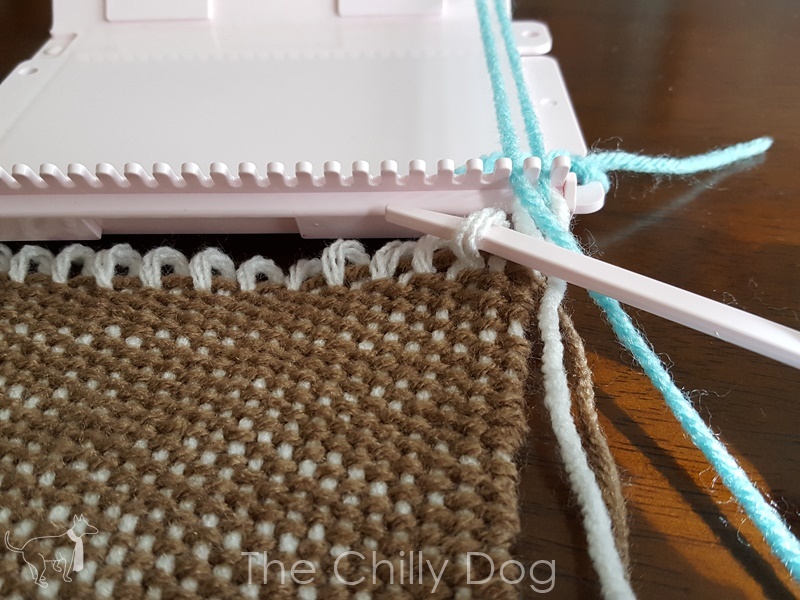 Over, under, over, under, back and forth. 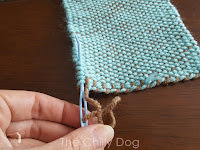 One thing that is very important to remember is not to pull the weft yarn, too tightly. 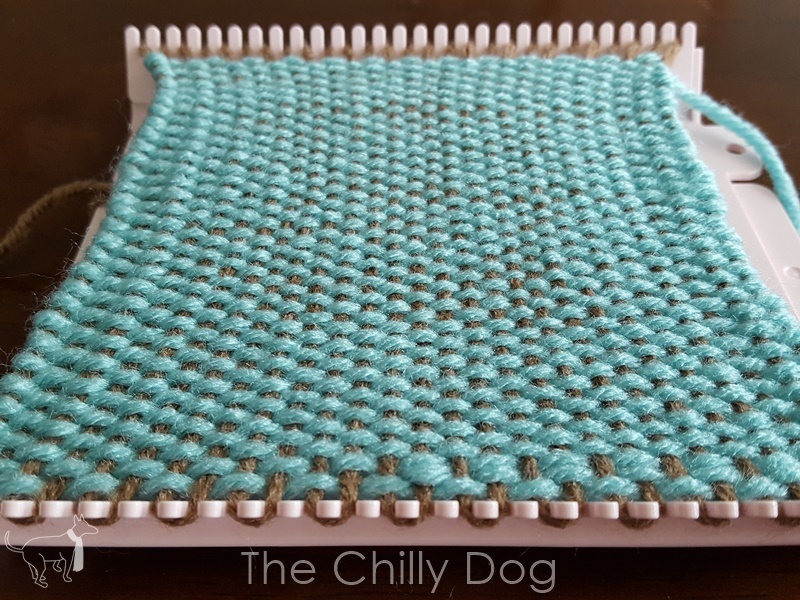 This takes some practice. 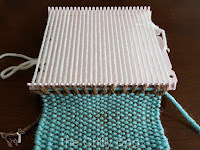 If you are not paying attention, your weaving can very quickly become too tight and misshapen. 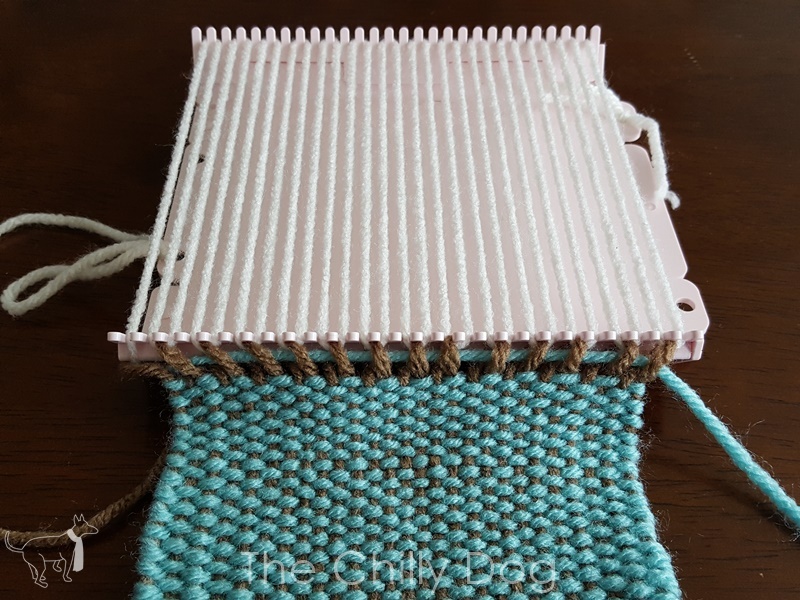 At a certain point, the weaving gets so close to the end of the loom that the shuttle will no longer fit between the warp strands. Simply remove the weft yarn from the shuttle and use the needle to weave the rest of the piece. 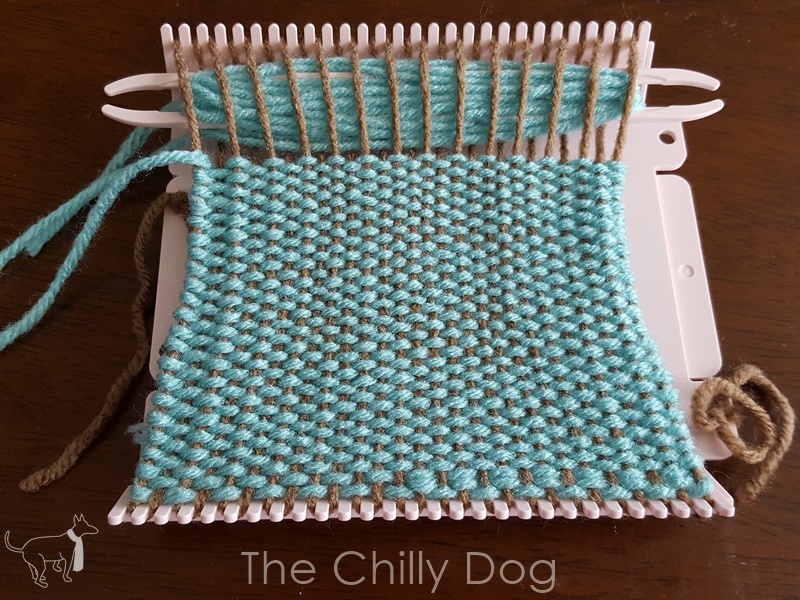 For the record, my weft yarn passed across the piece 58 times in the first section, which was awfully close to my prediction of 60. Pull off a spacing bar and carefully lift the first motif off the loom. 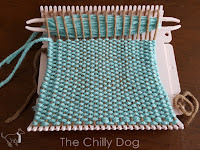 Before attaching the first motif to the second you need to cut a piece of yarn to set up the next warp. Since there are 27 teeth on the spacer bars, wrap the yarn 27 times around the shuttle, then 3-4 more times just to make sure you have enough. 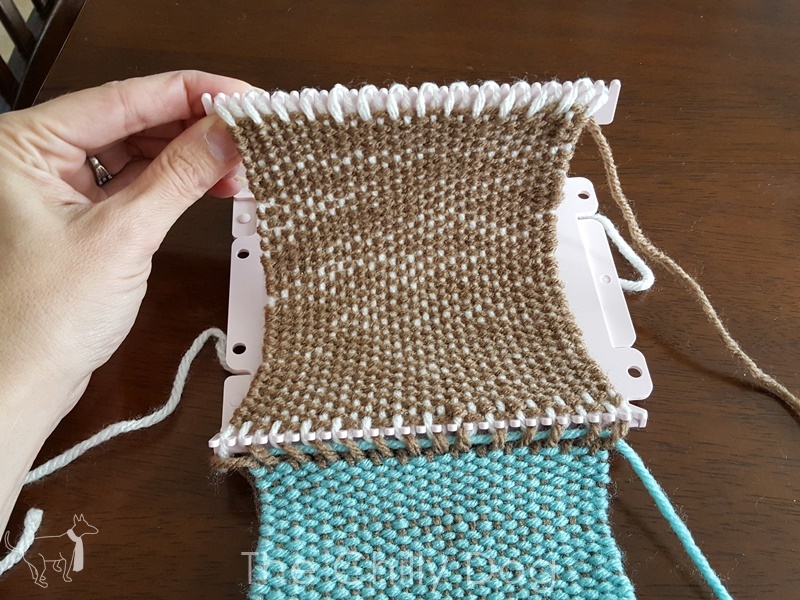 No need for the fancy figure eights here because you are just using the shuttle to help you measure the yarn. 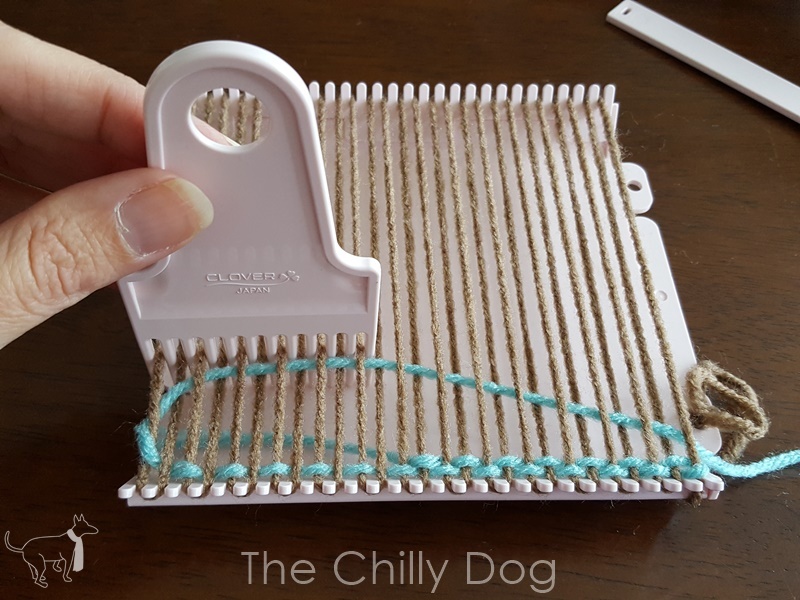 Cut the yarn, remove the yarn from the shuttle and use the needle to join the first motif and wind the warp yarn as directed. 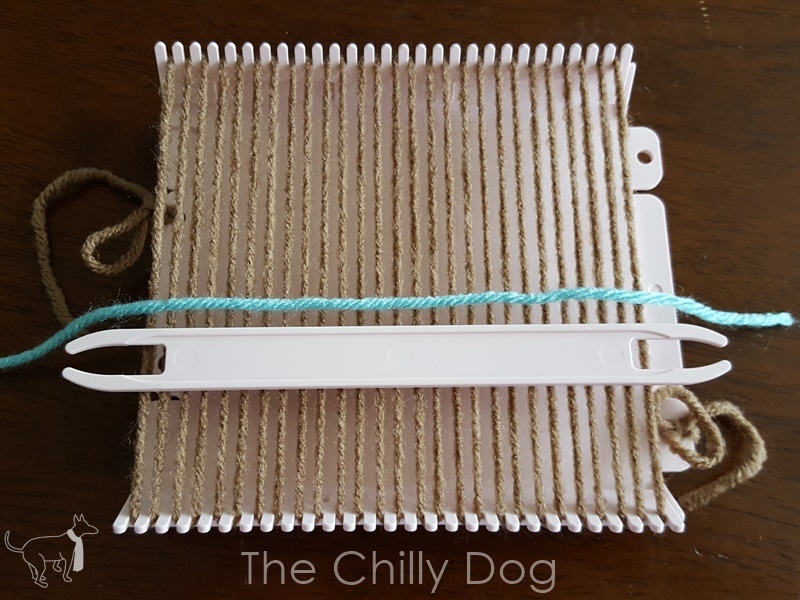 Once the warp yarn is on the loom, wind the weft yarn onto the shuttle. 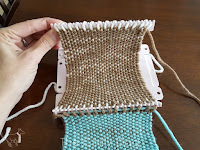 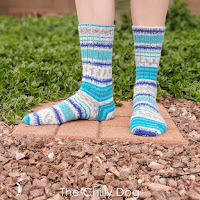 If you are using the same type of weft yarn as for the first motif, you can use the same approximations you did when wrapping the first shuttle full of weft yarn. Remove the second motif from the loom. 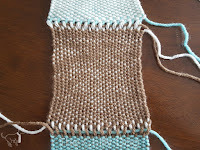 Measure out the warp yarn for the third motif. 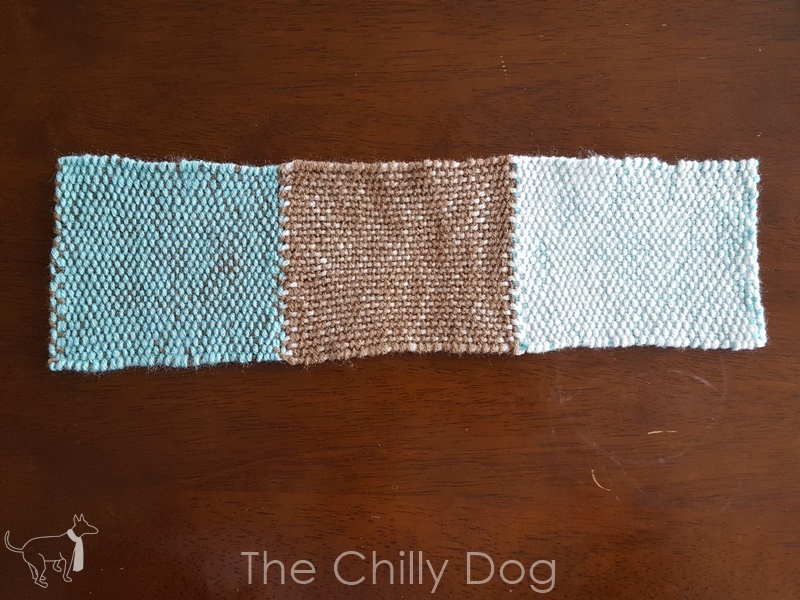 Attach the second motif as directed and wrap the warp yarn. 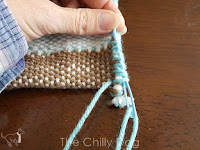 Wrap the weft yarn onto the shuttle and finish the third motif. 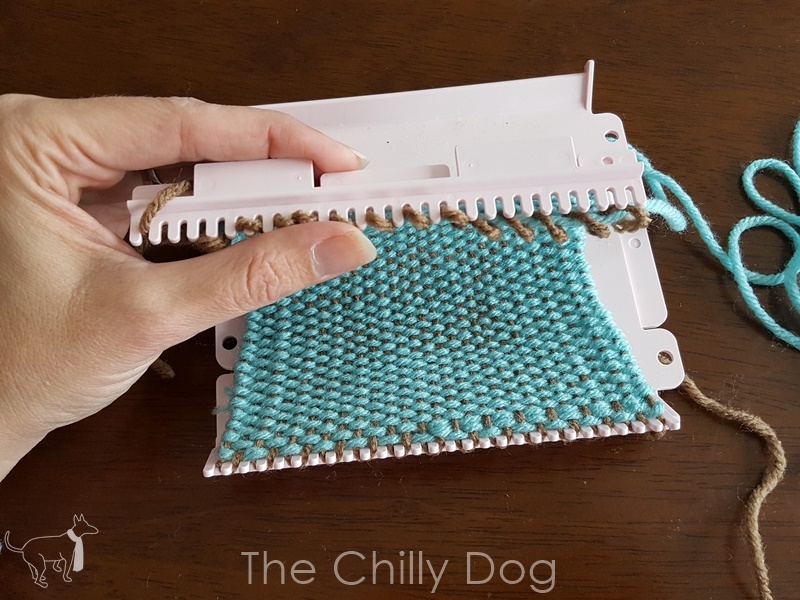 Take the entire piece off the loom. 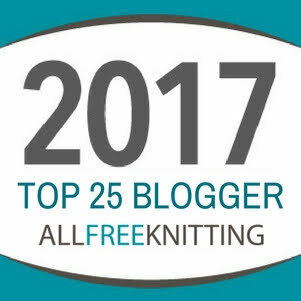 At this point, things may not look great. 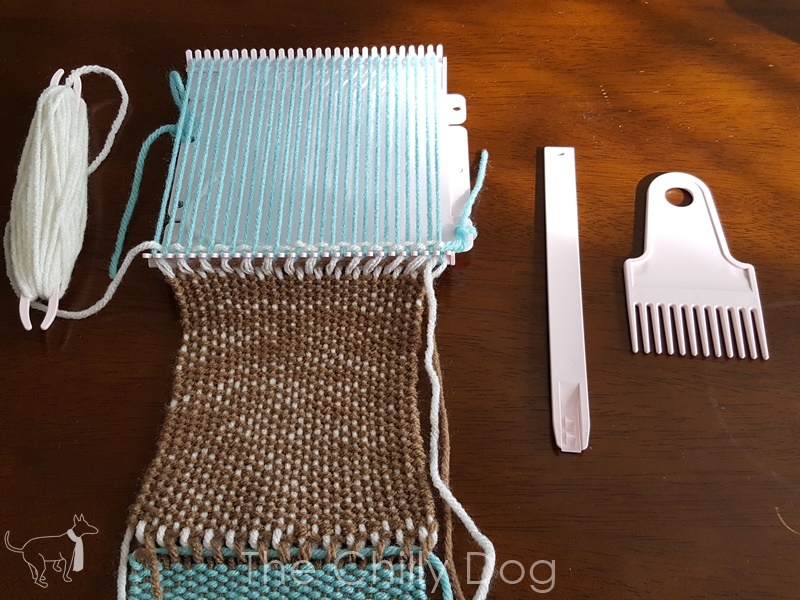 Use the comb to even out the weft yarns. 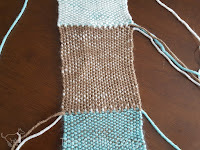 Before evening things out, it looks like there are big spaces between the motifs. 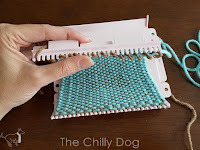 Gently combing the weft yarns makes those gaps virtually disappear, but there are still a lot of loose ends. 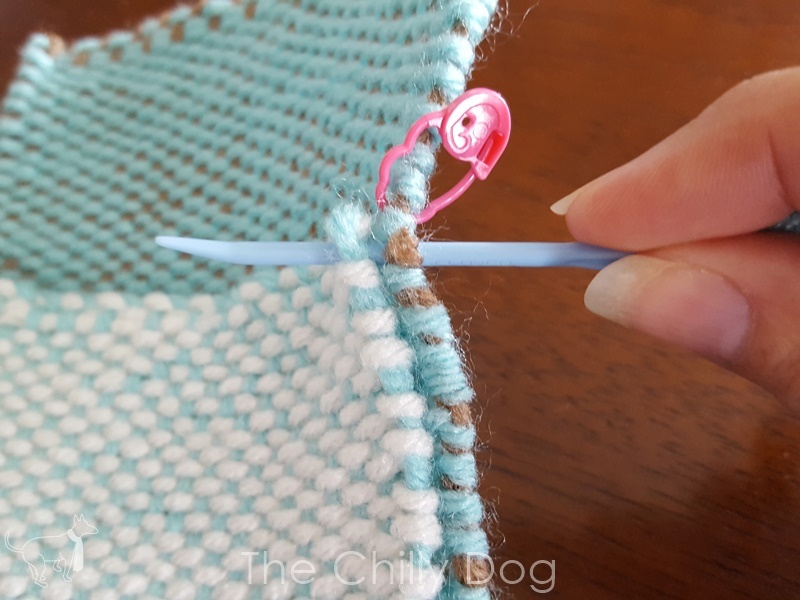 Use a yarn needle to weave in and conceal all of the warp and weft tails as directed. 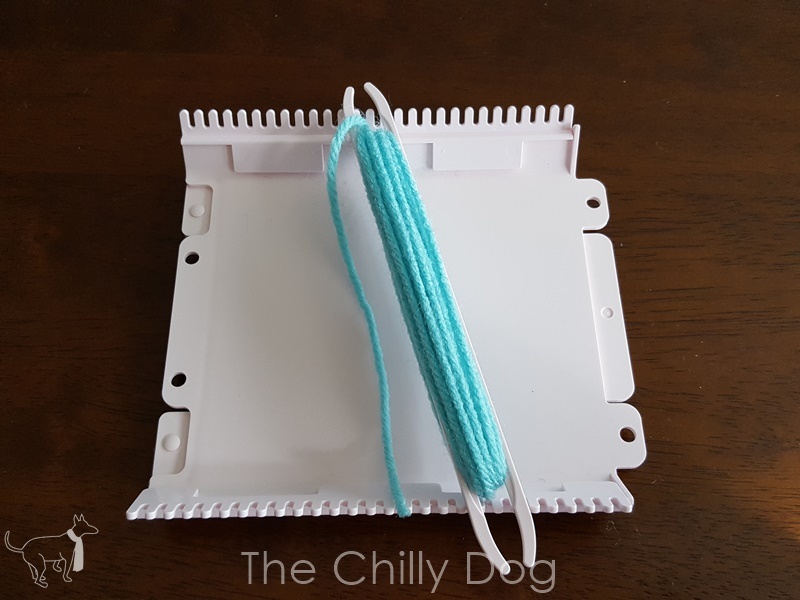 Things should be looking much better now. 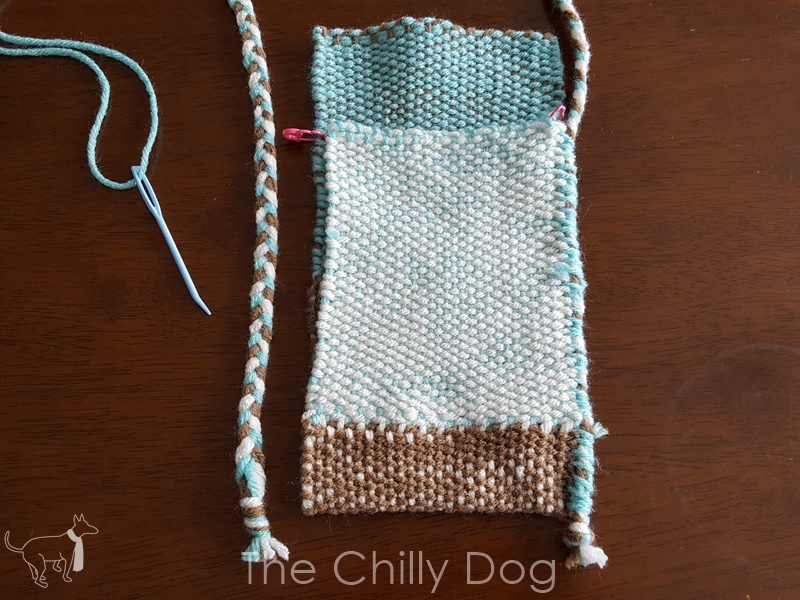 Now it's time to make the strap. 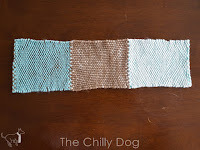 Figure out how long you would like your strap. 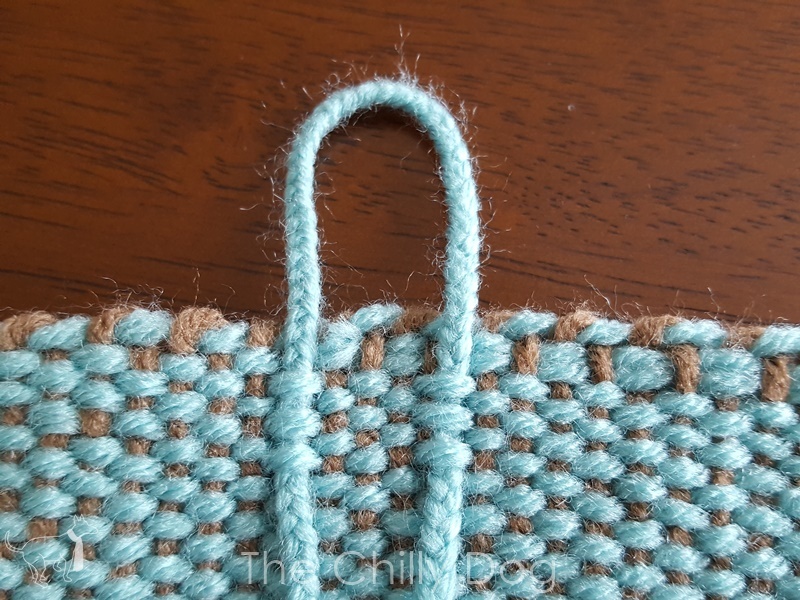 Cut nine strands of yarn (three of each color) 1 1/2 times longer than the desired strap length. Braid the strands together and knot each end. 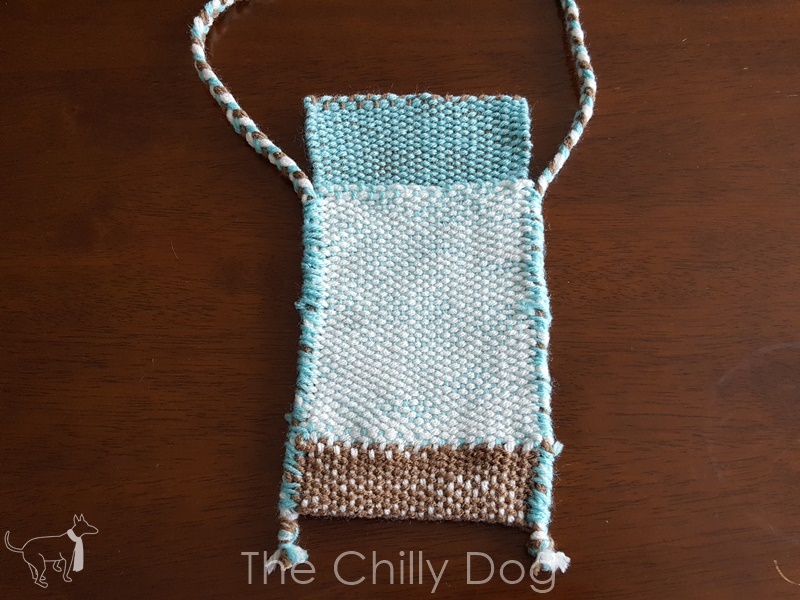 It's better to make your strap too long than too short. You can always trim it down later if you need to. 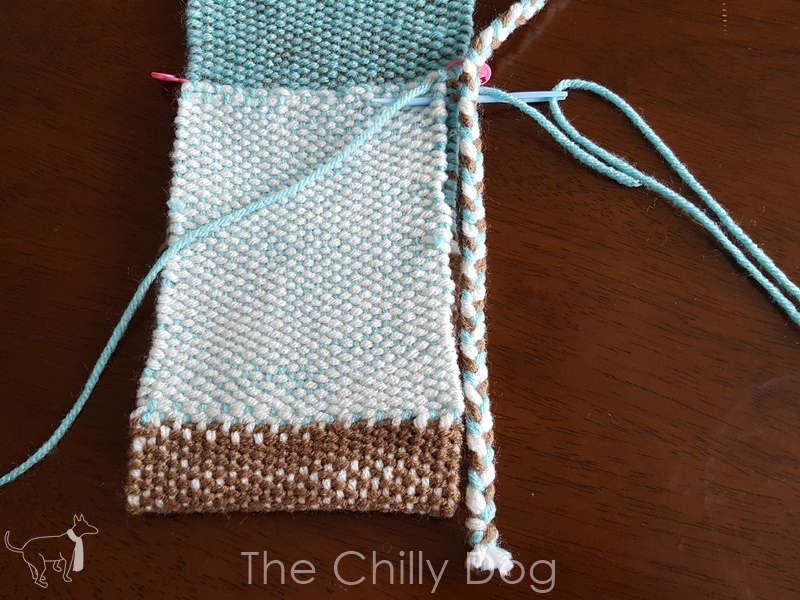 Decide which end of the weaving will be the flap of the bag. If one end is a little wider than the other, that's the end that should be the flap. 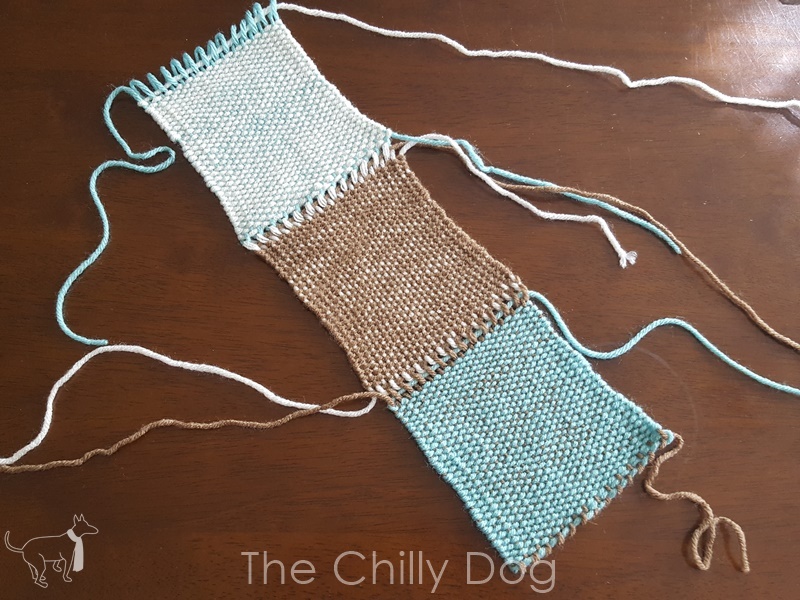 For me, the blue end was slightly wider than the white. 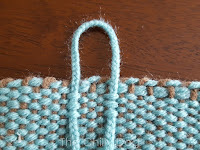 Fold the flap in half and place a locking stitch marker around the side warp yarn, between to wefts, at the fold. 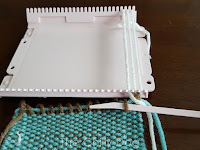 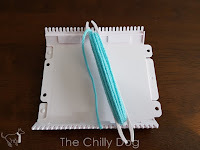 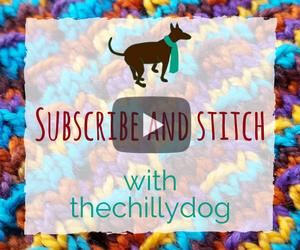 Follow the weft yarn across and place a stitch marker on the opposite side of the flap. 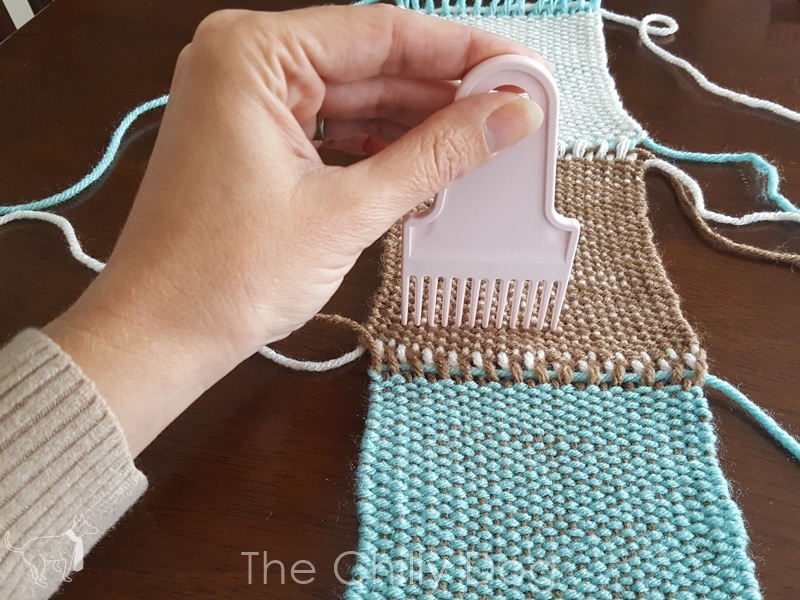 It is very important that there are the same number of weft strands between the stitch marker and flap edge on both sides of the bag. 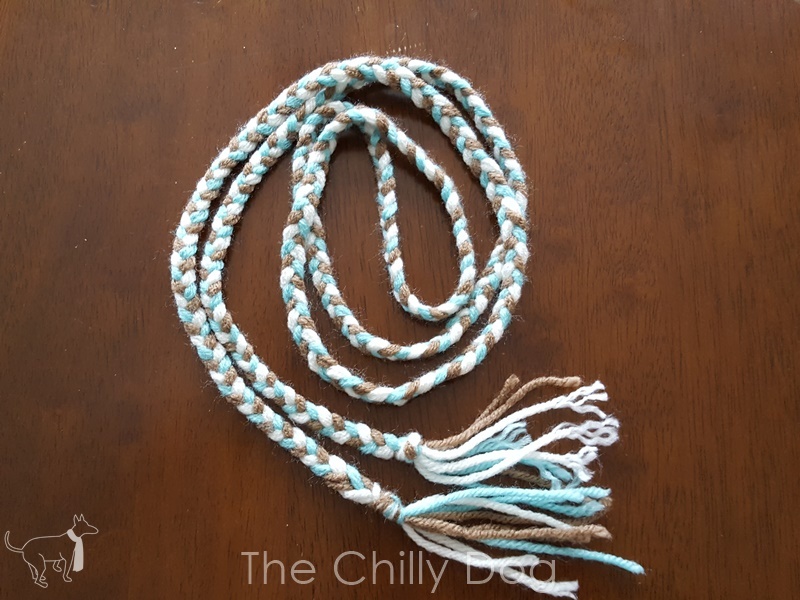 Cut a piece of yarn about 4-6 feet long. With a yarn needle, you will use this yarn to finish the side of the bag and attach the strap. 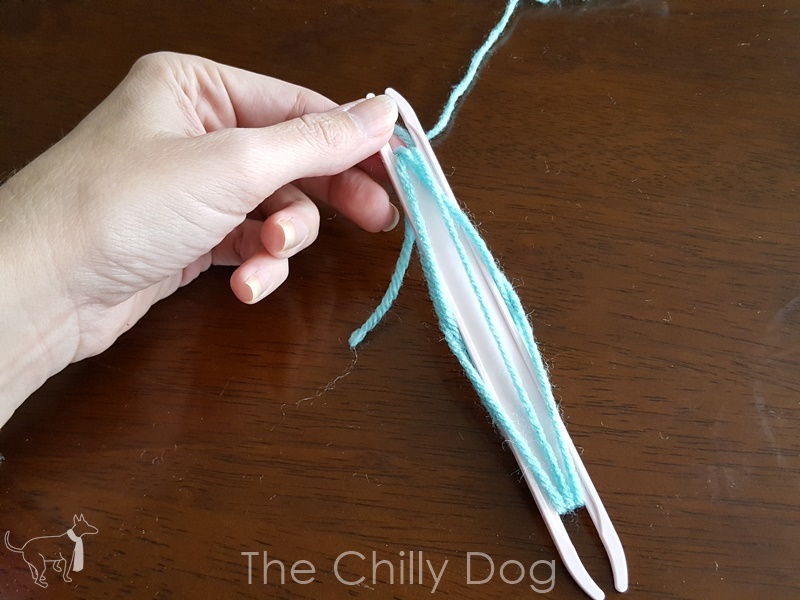 Fold your weaving, wrong sides together, so the end of the weaving is even with one of the stitch markers. 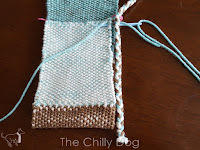 Pull the yarn around the warp yarns along the side of the bag. 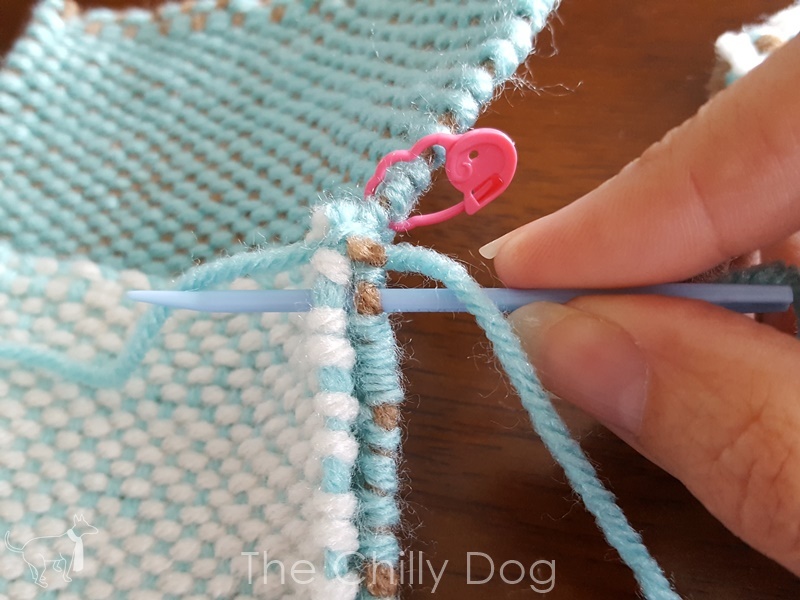 Pull the yarn through the same spot a second time to secure the end. 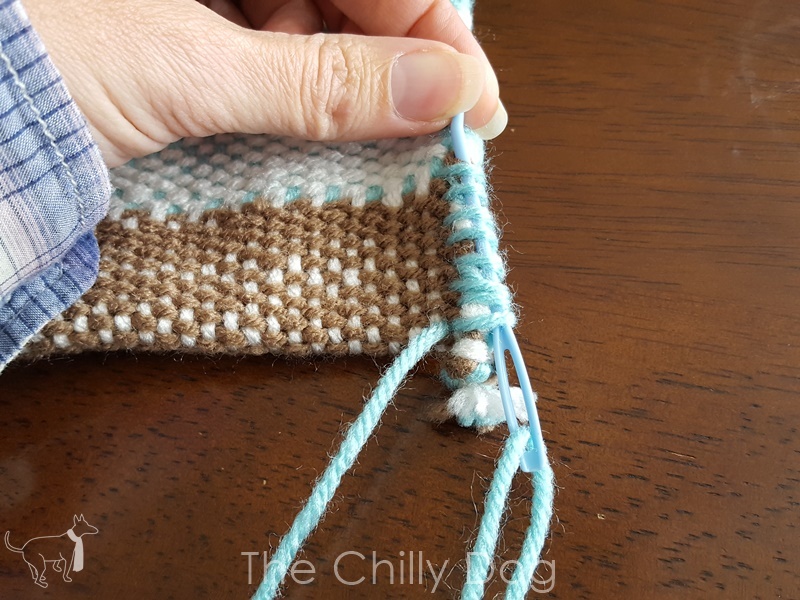 Slide the needle around the warp yarns under the next weft strands. 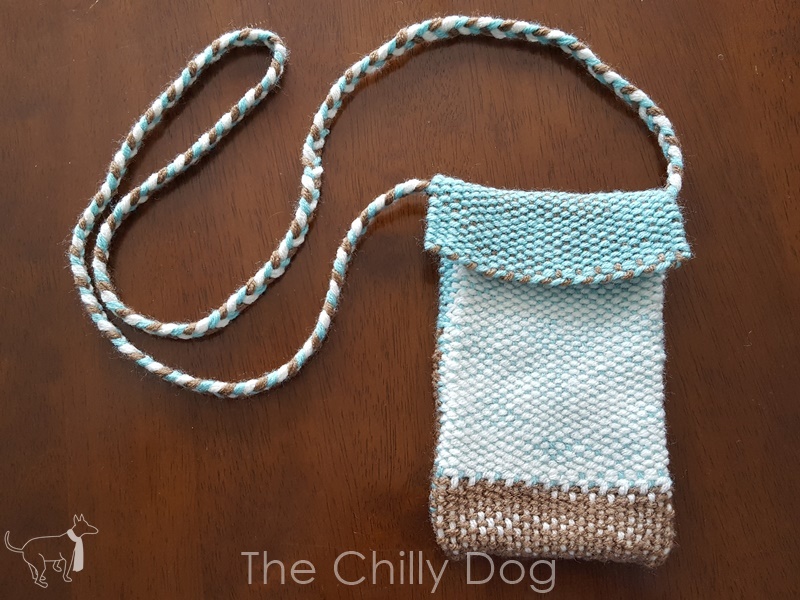 Position one side of the strap so the knot is at the bottom of the bag. 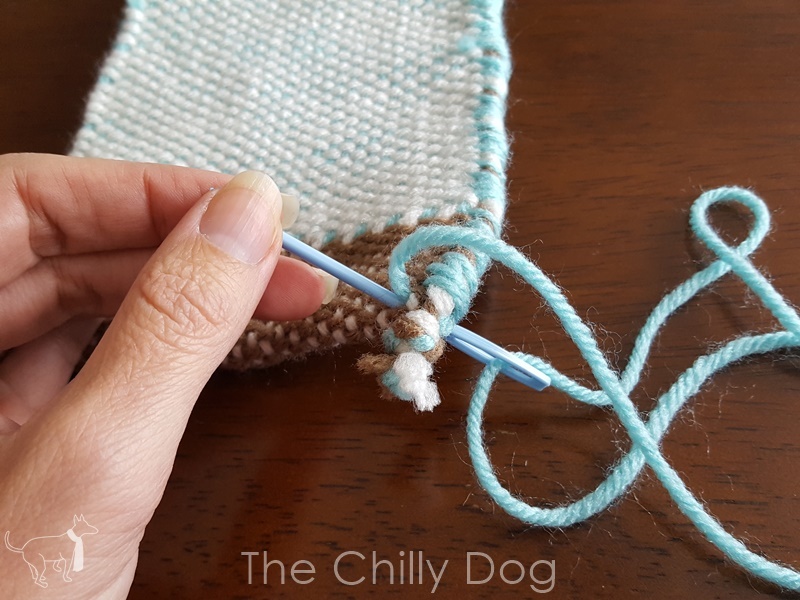 As you pull the needle through, make sure the yarn wraps around the strap to hold it in place. 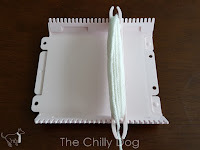 Continue whip stitching down the side of the bag. When you get to the end, pull the yarn tail up through a few of the whip stitches to conceal it and trim the end. 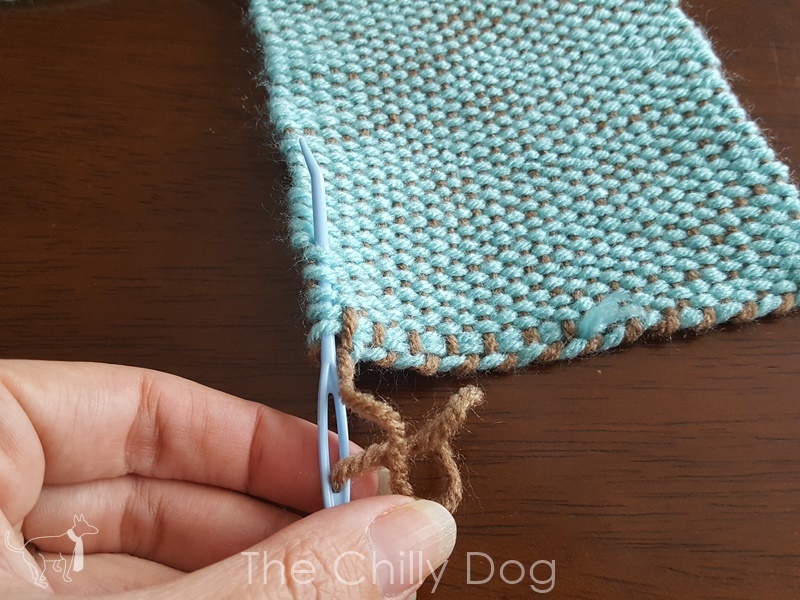 Now that one end of the strap is attached, double check the length and adjust it if necessary. 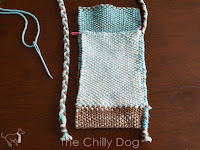 Attach the second strap and join the sides of the bag as before. 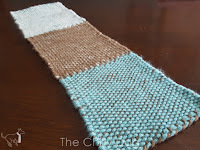 Cut three strands of yarn 9 inches long and weave them together. Use a yarn needle to pull each side of the braid under three weft yarns on the wrong side of the flap near the center. 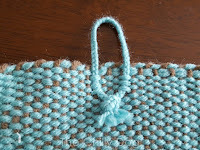 Knot the braid ends and trim. 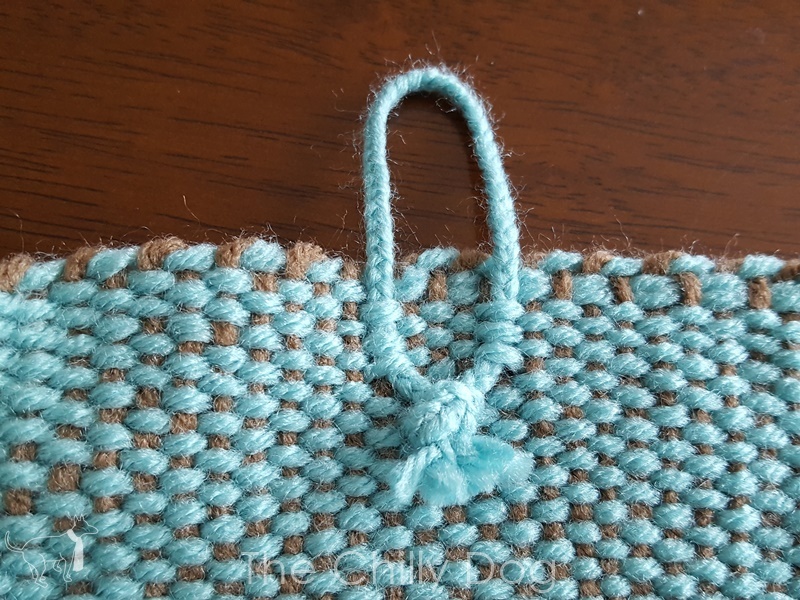 Use a needle and thread to sew a button onto the front of the bag. 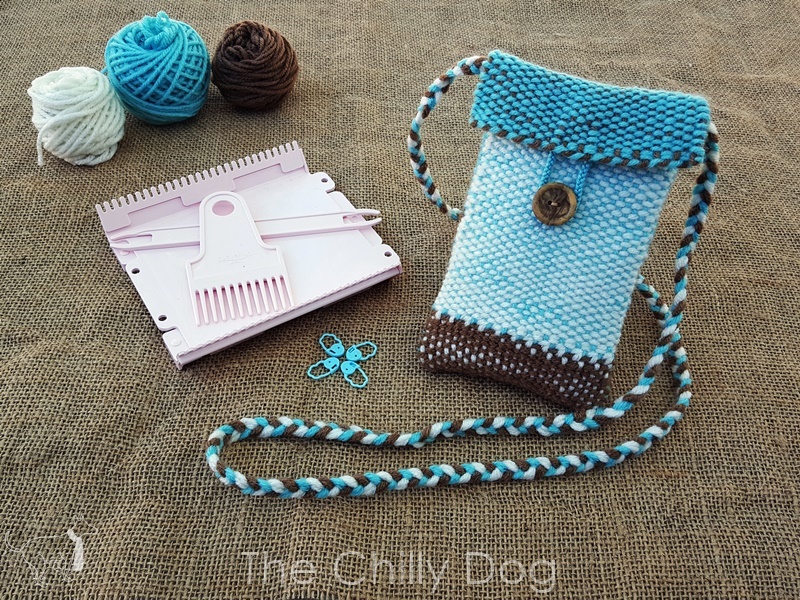 Your mini weaving loom, mini purse is ready to go.This purse is a nice compact size for those times you just want to carry the necessities. 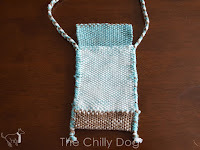 Learn how to weave a simple mini purse with the Clover Mini weaving Loom.